As Assistant Minister for Vocational Education and Skills, a key part of my job is consultation. I try to talk with as many people that make up our dynamic Vocational Education and Training (VET) sector as I am able. At home, I have continued extensive regional consultations to hear what government policies are working and what needs fine tuning from those working on the ground. In this regard, I was fortunate to attend a South Coast Policy forum in Warrnambool recently. At this forum, we discussed strategies to improve employer and youth engagement in apprenticeships, as well as approaches to tackling regional youth employment. Part of Government’s solution for this issue is a commitment to putting employers at the centre of skills and training package development, so they target specific skills that employers most need. I have also been consulting with our nearest neighbours on issues affecting our sector. Last month, I travelled to Jakarta for Indonesia-Australian Business Week to discuss the skills priorities for both countries, and how best to enhance this into the future. The visit was very productive, and I came home with a powerful, overarching message for all of you working, studying and teaching in VET; the Australian VET sector is extremely well regarded internationally. International education is the great success story of our bilateral relationship with Indonesia. Valued at $619 million in 2015-16, it represents our largest services export. This is significant and something we should all be proud of, so well done to all of you that contribute daily towards making our VET sector the best it can be. The Government is committed to raising the status of Australia’s vocational education and training sector both in Australia and overseas. This can’t be done without consulting with people both at home and at times abroad to see how we are doing, stimulate new ideas and bring them back to inform our future policy direction. Thank you again for all your feedback and hard work in our vibrant sector. Assistant Minister for Vocational Education and Skills, the Hon Karen Andrews MP, addresses the audience of IRC Chairs, hosted by Mr John Pollaers, (right) Chair of the AISC. 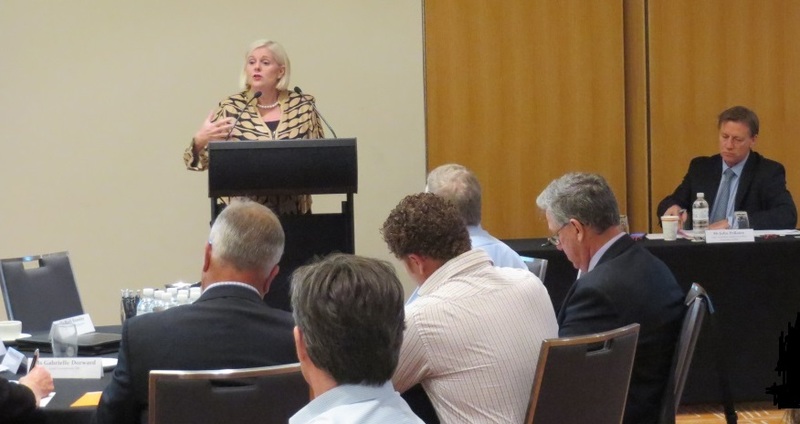 The meeting, held on 16 March, was addressed by Assistant Minister for Vocational Education and Skills, the Hon Karen Andrews MP, and hosted by Chair of Australian Industry and Skills Committee (AISC), Mr John Pollaers. Members of the AISC and representatives from the six Skills Service Organisations also attended. In her address to the IRC Chairs, Minister Andrews outlined the issues that have been raised during her consultations with a wide variety of stakeholders in the sector, all of which had confirmed her view that industry engagement is the key to informing effective reforms in the VET space. The meeting was also an opportunity for the IRC Chairs to give the Minister feedback and policy advice on the training system. Following the meeting, Minister Andrews published an update on her consultations and skills reform, which is available here. improving productivity of Australian businesses by making it easier for employers to upskill or reskill their staff, as well as better equipping the workforce to move between jobs. Achievements since the new arrangements began include removing 16 obsolete training packages and 178 qualifications from the system. Mr Pollaers also spoke about the IRC review. “The review has been pleasing on a number of fronts,” Mr Pollaers said. “We have taken the opportunity to reach out more broadly than ever before and the calibre of people putting themselves forward is terrific. He also outlined how the AISC was building a consolidated evidence base of industry insights to inform the work and decisions of the committee. This evidence base, in part, is formed by the industry analysis undertaken by each IRC as part of their work plans. It is supplemented by existing national data and evidence about employment and skills, as well as research commissioned by the AISC itself. The AISC is consolidating this into the National Industry Insights Report, which will be available in an easily accessible web format so that a broad range of stakeholders can use the information. There are around 60 IRCs, with 500 representatives from a diverse range of industries. IRCs are made up of people with expert knowledge of their industries and they have a key role in making sure that training package qualifications meet the needs of employers now and in the future. You can find out more about the AISC and IRCs on the AISC website. Senator the Hon Simon Birmingham, Minister for Education and Skills led the 2017 Australia-India Education and Skills Mission to India from 10-11 April. The Mission brought together representatives from industry, the education and training sector, and government, to explore how Australia and India can strengthen the education and training relationship, and make a contribution to global skills and knowledge. It was an exciting opportunity for delegates to establish stronger links with Indian counterparts while gaining a deeper understanding of the Indian training market and the challenges it is addressing to educate and skill its large population. The program involved industry-based workshops, site visits to Indian training facilities and culminated in the Australia-India Skills Conference, Skilling a Global Economy. With keynote addresses from Senator the Hon Simon Birmingham, Australian Minister for Education and Training and Sri Rajiv Rudy, Indian Minister for Skill Development and Entrepreneurship, the conference examined how the changing nature of work and emerging models of industry engagement and partnerships are creating new opportunities for collaboration. Further information is available in the Delegates’ Program. Alexander Halls and Dougal King were recently given the opportunity to create a garden at the Melbourne International Flower and Garden Show. Following their gold-medal winning success at the 2016 WorldSkills’ national competition, Alex, 22, and Dougal, 21, were selected as members of WorldSkills Australia’s Skills Squad. The garden show presented a valuable opportunity to hone their skills in the lead-up to possible selection for the Abu Dhabi competition, where the landscaping category will see 23 countries competing over four days. 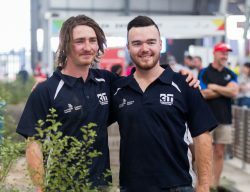 Alex and Dougal both train at the Canberra Institute of Technology (CIT) and have as their dedicated skills mentor Michael Blasch, a horticulture teacher with CIT and an international landscaping expert with WorldSkills Australia. Read more on the WorldSkills Australia website. Applications for the Bert Evans Apprentice Scholarships are now open. Apprentices facing financial hardship while pursuing trade qualifications can apply for a Bert Evans Apprentice Scholarship which can help them with buying tools or their travel to on-the-job training. Up to 50 scholarships are awarded each year including 10 NSW Country Apprentice Scholarships, and each is worth $5,000 per year over three years. The applications close COB 5.00 pm Tuesday 30 May 2017. TDA has announced the appointment of former senior Commonwealth and Victorian government education official Mr Craig Robertson as the organisation’s new Chief Executive Officer. Mr Robertson was most recently Deputy Secretary, Higher Education and Skills, at the Victorian Department of Education and Training. With the Commonwealth Government he served in a number of leadership positions covering most aspects of vocational education and training and other areas of social policy. Ms Mary Faraone, Chair of TDA welcomed Mr Robertson’s wealth of experience across the broader education sector and, in particular, his knowledge of the needs, priorities and trends shaping vocational education and training. The TDA Board also thanked retiring CEO Martin Riordan for the outstanding job he has done in advancing the position of TAFE across the domestic and international landscape during his twelve years leading TDA. 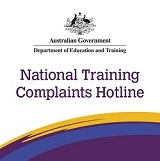 The National Training Complaints Hotline is a joint initiative between the Commonwealth, state and territory governments. Anyone with a complaint or query about the training sector now has one number to call, so they can report a complaint and have it referred to the right authority for consideration. Call the National Training Complaints Hotline on 13 38 73 and select option 4 (Monday – Friday 8 am to 6 pm). To email, please see the process for submitting an email complaint. This year we need your help to encourage more students to consider VET pathways and the best way to do so is by showcasing the many benefits of how learning a skill or trade can kick-start a career! Your school, TAFE, Registered Training Organisation (RTO), Industry Association, small business, company or charity can hold an event during the week to showcase vocational qualifications, highlight career opportunities, engage the public and stimulate career conversation. So jump on board and register your event today! Go to National Skills Week website or email SkillsOne to find out more. The Skills and Thrills careers showcase for schools takes careers out of the office and onto the screen with two dynamic action packed formats of film/live shows promoting vocational education and training and career outcomes for NSW students. NSW is driving a strong push for skilled and trade workers across a variety of vocational sectors, both city-based and regional. Skills and Thrills aims to encourage students to recognise vocational training as a first choice career pathway. This year SkillsOne will take the Skills and Thrills careers showcase to towns across NSW, engaging more students to connect their passion to a career outcome. The NCVER has released figures showing the number of people starting an apprenticeship or traineeship is up 2.9% for the September 2016 quarter, compared with the September 2015 quarter. The overall increase can be attributed to a 17% increase to 23,400 in non-trade commencements. Non-trade occupations recording increases include hospitality workers (up 600); and sales assistants and sales persons (up 500). A total of 278,500 apprentices and trainees were in-training as at 30 September 2016, a decrease of 5.7% from 30 September 2015. Australian vocational education and training statistics: Apprentices and trainees 2016, September quarter is available on the NCVER website. The 23rd annual Australian Training Awards was a fantastic opportunity to come together to celebrate the achievement of finalists. It was also a time to acknowledge and celebrate the VET sector and the opportunities it affords all Australians. The 2017 Awards will be held in Canberra in November. More information will become available on the Australian Training Awards website. Full profiles of the 2016 Australian Training Awards winners are available on the Australian Training Awards website. The search is on for South Australia’s top training achievers; the State’s best and brightest vocational education and training students, apprentices, employers, training organisations and teachers. The awards, hosted by the State’s Training and Skills Commission, recognise and reward individuals and organisations for outstanding achievements in training. Winners may be eligible to progress to the Australian Training Awards in November. For more information and to download the nomination booklet, which outlines eligibility and criteria, visit About the Awards. Nominations for the 2017 ACT Training Awards are now open! The ACT Training Awards are an annual celebration showcasing the commitment, innovation and outstanding achievements of all those involved in the ACT VET sector. Across 14 categories, the awards encompass the opportunity to recognise and reward the success of individuals and organisations in the ACT. Reflect on the people and businesses that you are involved with on a daily basis; who is a shining example of success in the VET sector? It could be you, your employer, your employee, a business, your colleague, your student, your training organisation or your teacher/trainer. Nominating in the ACT Training Awards is an opportunity to show your support for those involved in Canberra’s VET sector, which delivers some of the best outcomes and graduates in the country. Winners may go on to represent the ACT at the Australian Training Awards in November. More information, including a list of categories and how to nominate can be found on the ACT Training Awards webpage. Draft materials are now available for industry feedback for some of these projects and workshops are being organised which industry can register to attend. Feedback can also be provided via an online form or by email. Celebrate Earth Day on 22 April with stories of those following their passion in Conservation and Land Management. Working on country is one of Jarrod Edwards’ greatest passions and has led him to the role of the Land Management Supervisor at the Tasmanian Aboriginal Centre in Burnie. Through his love of nature and the outdoors, Jarrod plans to mentor the next generation of Aboriginal land management workers. Jarrod was a finalist in the 2016 Aboriginal and Torres Strait Islander Student of the Year Award at the Australian Training Awards. Sally works for the ACT Government’s Parks and City Services Division and is continuing her studies with a Certificate III in Conservation and Land Management. She has recently taken on a mentoring role in her workplace, assisting apprentices who are commencing their studies. Outside of her work, Sally plays professional cricket for the ACT women’s team and mentors young women cricketers who are just starting out in their sporting careers. Sally was named the 2014 Aboriginal and Torres Strait Islander Student of the Year Award at the Australian Training Awards. Horticulture is where Stephen Colloff’s passion lies; a passion he developed during an Australian Apprenticeship with Maxima and Burnside Council in Adelaide. Excelling at his apprenticeship, Stephen now works in the bio-diversity unit and nursery and hopes to expand his knowledge by studying for a Diploma of Conservation and Land Management. Stephen is an Australian Apprenticeships Ambassador. Jenna Conran followed her heart for the environment and completed her Certificate III in Horticulture (Parks and Gardens). She is continuing her studies through a Diploma of Conservation and Land Management and has been chosen to participate in the Office of Environment and Heritage’s Sustainable Leadership Program and nominated to attend the Public Sector’s 2017 Young Leaders’ Conference. Jenna is an Australian Apprenticeships Ambassador. If you would like to provide feedback, supply an article for inclusion in the next edition or join our list of subscribers, please email skillsatwork@education.gov.au. The next edition will be published in May 2017. Submissions are due by Friday, 21 April 2017.